If you've felt sleepy during school or wondered what a superfood is Are You What You Eat? explains which foods and food groups boost your energy and keep you healthy. Take the quizzes, read the facts and answer the questions to find out which foods keep your brain in top gear. Understand why healthy eating is so important and the positive impact it has on every aspect of your life. 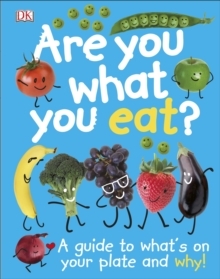 Packed with information on nutrition and healthy eating including vitamins, minerals and antioxidants, you'll be able to make good choices when you eat.